Sometimes we need negative around. We need them to encourage us to prove them wrong. To show ourselves that we don’t have to believe everything we’re told. I love what Film Courage is trying to do with their youtube series. It’s a great resource for anyone trying to get ahead in the film business. For me, it’s just a relief to see my peers suffering like me. Lol. With that said, I try to soak up as much as I can to avoid their same pitfalls… or at least help myself prepare for the landing. 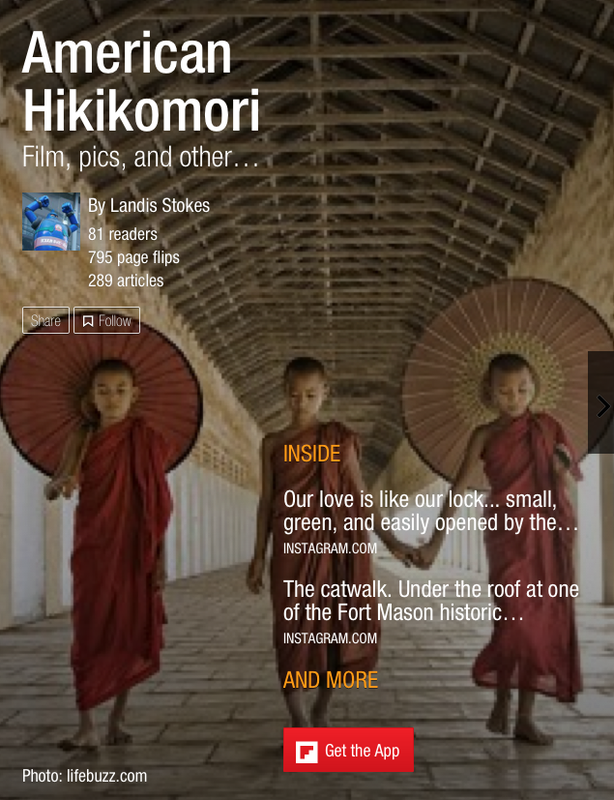 Subscribe to our new Flipboard magazine, American Hikikomori! Over 100 readers and growing! Like us on Facebook and follow us on Twitter. Or sign up for our Newsletter through our Website. Our new Flipboard magazine is up! Many thanks to our all our followers and readers! We just getting started. Author hikikomori78Posted on June 3, 2014 Categories FilmTags American Hikikomori, Facebook, Flipboard, hikikomori, Social media, Twitter, wordpressLeave a comment on Our new Flipboard magazine is up!